Text is copiously annotated in an effort to acquaint the twenty-first-century reader with the events, mannerisms, and characters of the period and provide an entryway into the world of Balzac's Paris. The book is a compendium of some of the best "gastronomical" anecdotes up to his time, most of them told with a humorous or ironic tone. Does not focus on restaurant reviews or personal culinary experience, or recipes, for that matter; Briffault's interests are first and foremost social and cultural. 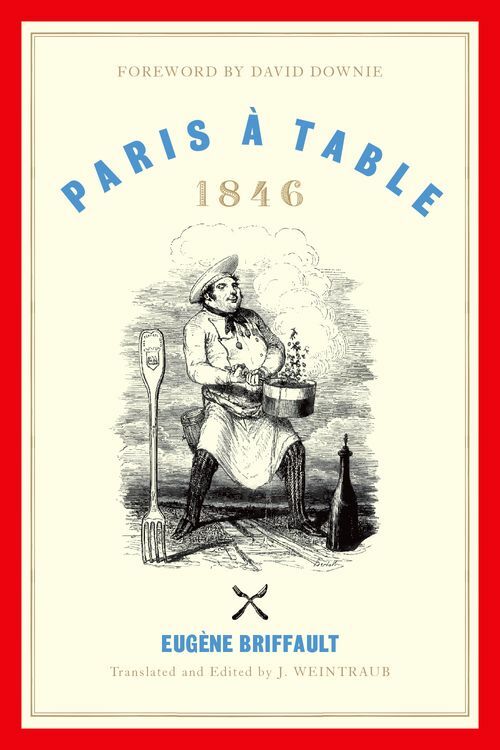 Paris à Table: 1846 is the first English translation of a seminal book in the literature of nineteenth-century gastronomy, a work described by Le Monde as "the richest view of Balzac's time seen from the table." It was written by the journalist Eugène Briffault, well-known in his day as a theater critic and chronicler of contemporary Paris, but also as a bon-vivant, celebrated for his ability to quaff a magnum of champagne from a bell jar in a single draft and well-qualified to write authoritatively about the culinary culture of Paris. Focusing on the manners, customs, and "moeurs" of the dining scene, the author takes the reader from the opulence of a dinner at the Rothschilds through every social stratum down to the laborer eating on the streets. He surveys the restaurants of the previous generation and his own-from the most elegant to the lowest dive-along with the eating habits of the bourgeoisie, the importance and variety of banquets, the institutional meal, and even the plight of "people who do not dine." Briffault was also a fine storyteller, and the book is a compendium of culinary anecdotes, from the tantrums of a king deprived of his spinach to the tragedy of "the friendliest pig that was ever seen." The edition also includes the humorous drawings of the caricaturist Bertall, artwork that cleverly reinforces the witty and ironic tone that pervades the text. Along with an introduction -which provides the first modern biography of the author and analyses the place of Paris à Table in the literary culture of the time—the text is copiously annotated, acquainting readers with the events and characters that appear in the narrative and providing an entryway to the author's Paris, the city Walter Benjamin characterized as "the capital of the nineteenth century." Eugène Briffault (1799-1854) was an editor, journalist, theater critic, and man-of-letters, who, as a chronicler of contemporary Paris, contributed to many anthologies and periodicals of his day. J. Weintraub is a Chicago writer, dramatist, poet, and translator. His work has appeared in many literary journals, regional publications, and such journals as Gastronomica: The Journal of Critical Food Studies.